I was slightly concerned about the change in tone for the series, going from Geoff Johns to Jeff Parker as the writer. But really, having read the issue now, I shouldn’t have worried at all, because Jeff Parker writes this issue as if he’s been on the series from the start. The transition from one writer to the other is pretty much seamless, and for a long-time reader like me, that’s pretty damn fantastic. Sure, Jeff’s script is much more humorous than Geoff’s usually are, but its a small enough difference and personally, I welcome Jeff’s writing flourishes. He’s been pretty good on Batman ’66 and if this issue of Aquaman is anything to go by, then he’s going to be a perfect fit here too. With everything that has happened in the Death of the King arc, the political climate of Atlantis has changed significantly. Complicating matters is the fact that Aquaman is still dividing his time between the surface world and Atlantis. His detractors in the underwater kingdom claim that he puts too much thought into the cares of the surface world, a place that has historically been very antagonistic towards them. What they see is him not giving Atlantis the due attention that it deserves. So Arthur is basically navigating a political minefield right now. Matters are further complicated by the fact that since Mera is not of Atlantis but of Xebel, she is not trusted by many Atlanteans and is even disrespected, something she is aware of and doesn’t care about. What I liked about Jeff’s Mera was that she is very pro-active and is always busy doing something. He makes full use of her in this issue and given that angle that he is working on here, I expect Jeff to do some really big things with her down the line once he has his hand set with the series. There are some great moments in the issue and one of the best things is that Jeff continues to develop Aquaman’s power set. This time we see him and Mera working together in the second half of the issue to take care of a problem almost half a world away. The way that Aquaman, well, transports himself is incredibly unique and jaw-dropping and full of action, given the result of it. Jeff said in an interview that he’s going to be looking to do things like this and that he’s going to add to all the mythology and lore that Geoff built up. I can definitely see the seeds of it. Paul Pelletier is on the art, as I said, and its great to see him with a different artist. Since Jeff’s style is similar to Geoff’s, Paul is still a great fit for the book and he continues to deliver some really gorgeous underwater visuals. That’s been one of the strengths of the series from day 1, with all the different artists who’ve contributed to it, and it holds true for Paul as well. His Mera and Arthur and his monsters are just plain great. Artist Netho Diaz does a few fill-in pages here and the transition at times can be slightly jarring, but not overly so. His characterwork with expressions isn’t as good as it is with Paul, and it shows, but by and large, he does ok. Overall though, I’ll say that Aquaman is in damn good hands right now. More Aquaman: #0-12, #13-15, #16-21, #22-23, #23.1, #23.2, Annual #1, #25. 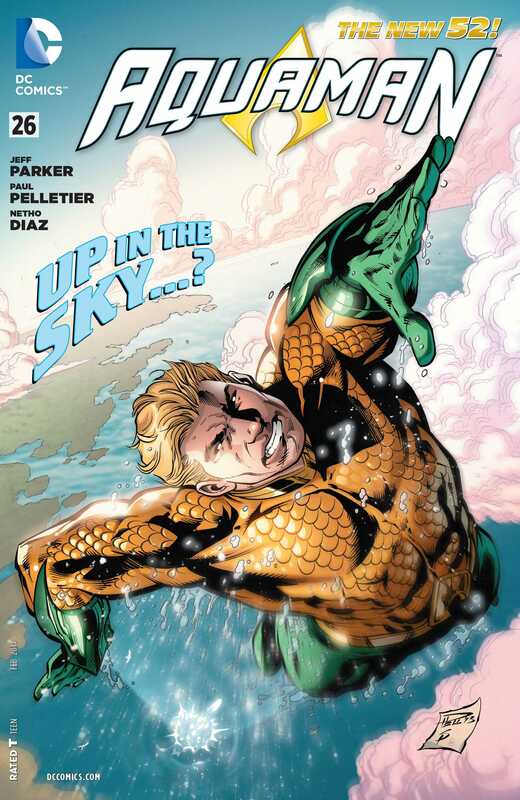 Posted on January 3, 2014, in Comics Reviews, Review Central and tagged Andrea Dalhouse, Aquaman, Atlantis, Comics, Comics Review, DC Comics, Dezi Sienty, Jeff Parker, Mera, New 52, Paul Pelletier, Review, Review Central, Ruy Jose, Sean Parsons, Superheroes, Wil Quintana. Bookmark the permalink. 11 Comments.